This is Chiara. Before looking into methods for assessing the value/s of crowd-sourcing using the framework that I briefly outlined in my previous post, I think it important to introduce our proposed model of engagement. As the title suggests, Crowd and Community-fuelled Archaeological Research looks to engage the public through crowd-sourcing by consolidating and gradually enlarging communities of interest in archaeology and the human past that already exist online and/or offline. It will be interesting to study the dynamics of community building, which could also be seen as the progressive welcoming and organisation of ‘unknown crowds’ into communities. In the first few months, we will start with proposing three projects for crowd-sourcing and three for crowd-funding, which will deal with content and activities that already have associated communities of interested amateurs. 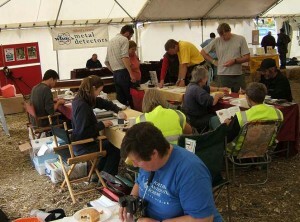 Some of these communities are organised as local archaeological societies, others are more widespread geographically (for example, the group of metal detectorists who contribute to the Portable Antiquities Scheme). We will also leverage on communities related to our partnering institutions. 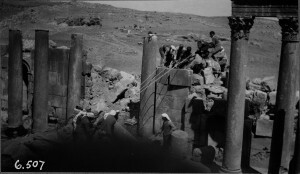 For example, we hope to involve friends of the British Museum and UCL Institute of Archaeology alumni who are keen on the history of archaeology. 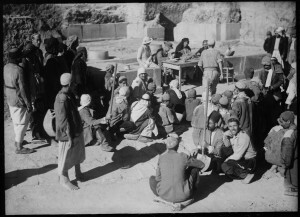 For them, but also for local communities in the Levant and for anyone fascinated by travels and archaeological discoveries, we will unlock some unique shots from the UCL Institute of Archaeology photographic archives, such as those shown below. We will upload a set of these photographs on our crowd-sourcing platform (now under development) and invite contributors to enrich them through tagging. One of the most exciting aspects of the project will be that of experimenting with crowdsourcing to review, digitise and enrich existing data (a “contributory” kind of engagement), but also to allow the co-design of new research agendas (“co-creative” engagement) and propose for crowd-funding those that community members value the most, while enabling communities to use the crowd-funding platform for their own pre-designed archaeological and heritage projects as well (“hosted” model of engagement). The three components of MicroPasts (crowd-sourcing, co-design and crowd-funding) will be activated progressively in the initial stages of the research. Participants will be encouraged (not obliged) to work in steps, from data co-production, to the use of this data for new research and the retrieval of the financial resources needed to make this research happen. This will help scaffolding the community engagement. The criteria for identifying the most ‘valued’ projects that should be put forward for crowd-funding, amongst those co-desiged with communities, will be the subject of dedicated discussion with community members on the forum. This collaborative activity will be fundamental to understand what ‘value/s’ are attributed to archaeological research, tangible and intangible heritage, in contemporary society. The project will then test crowd-sourcing not only as a method for crowd and community-fuelled archaeology, but also as a digital research tool allowing indirect investigation on the role of archaeology and history as formal disciplines and practices in today’s world. In this way, it hopes to contribute to a more sociologically-oriented public archaeology and to more value-centred heritage studies. I look forward to starting this research and reporting to you about it on this blog! In my previous post, I drew attention to the importance of assessing the value of using crowd-sourcing for joined-up research into the human past, but how to go about it? How can value be understood in this context? Value for whom? I am interested in studying the value resulting from experiences of engaging with crowd-sourcing through time, for different community members. The latter can potentially range from ‘professionals’ working in research institutions, the GLAM or private sector, to amateurs and any interested members of the public. This community focussed perspective is better suited for the aims of our project and allows combining into a coherent whole approaches that are traditionally distinguished as being people or institution-centred. A number of valuable papers and reports have addressed issues related to the evaluation of crowd-sourcing in both the science and cultural heritage sectors. However, none, to my knowledge, has explicitly tried to examine how contributor experiences change through time together with their perceived and real value. This is what this project hopes to achieve. 1. the social motivations for engaging with crowd-sourcing, where engagement is provisionally defined as accessing and contributing to the crowd-sourcing platform with content and/or a donation. 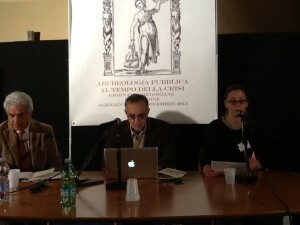 Motivations for participating in crowd-sourcing are successfully analysed and reviewed in relevant literature (e.g. Raddick et al. 2009, Dunn & Hedges 2012, Ridge 2013), but not with attention devoted to understand, in depth, how they evolve as contributors’ engagement progresses, nor in relation to archaeology in particular. 2. the dynamics of community building that lead contributors to seek satisfaction for their social motivations (e.g. helping, learning, contributing knowledge) by joining the crowd-sourcing community. More specifically, here it will be useful to explain the role played by the following: socio-demographic characteristics; family and friendship ties; cultural practices; the fact of belonging to already established communities of interest; contributors’ understanding of and interest in archaeology and history; the kinds of tasks that are proposed on the platform, the way in which engagement is structured and how the online space is organised. 3. the nature of the engagement experience: for example, whether it is anonymous or ‘authored’, a one-off try or an effort sustained through time, whether it involves exchanges of ideas with fellow members of the community or not, and how the factors mentioned under point 2. have an impact on the nature of engagement experiences. 4. the value resulting from engagement experiences directly or indirectly. Particularly, I would like to explore what cultural and economic resources have been mobilised by experiences of engagement and the value that contributors attribute to those experiences for their own sake. What knowledge is exchanged within crowdsourcing communities? What donations have been made to projects proposed for crowd-funding? How are ‘flow’ experiences triggered? In one of my next posts, I will start discussing a methodology suitable for applying this framework, and assess the value of crowd-sourcing for community engagement with archaeology. 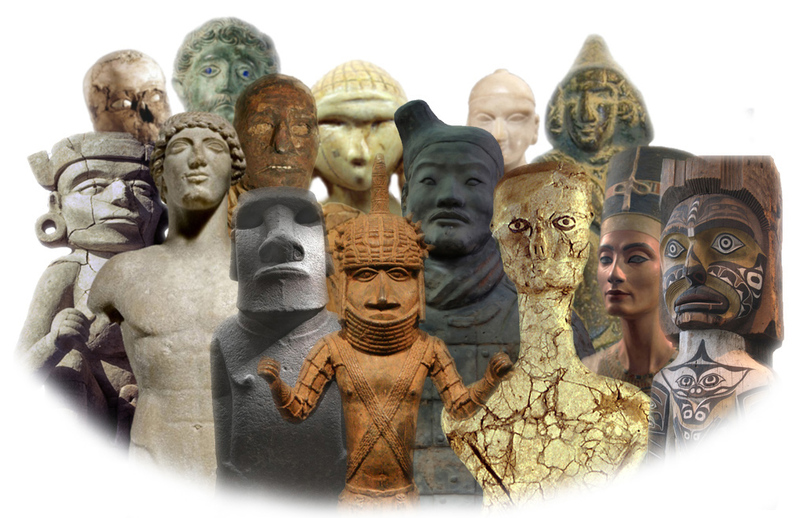 What value is there in crowd-sourcing archaeological research? This is Chiara. I am a researcher on the AHRC-funded project Crowd and Community-fuelled Archaeological Research, at the UCL Institute of Archaeology. As part of my role, I am currently working on the development of a methodology for assessing the value of using crowd-sourcing and crowd-funding to engage online communities with archaeology and the human past. In doing so, I am building on some prior research I have done on public perceptions and experience of archaeology through museum visitation, television viewing and digital media, but also on motivations for and the value of digital cultural engagement with museums and heritage more widely. The opportunity of studying how crowd-sourcing can facilitate participatory kinds of archaeological research is really an exciting one. In this blog post, I would like to say a few words on the three main reasons why I think that this evaluative work is important. 1. Promoting cross-fertilisation and inter-disciplinarity. Crowd and Community-fuelled Archaeological Research will test a mixed contributory, collaborative and co-creative model of public engagement with archaeology. Given its aims, the project can be situated within four disciplinary areas at least: public archaeology, cultural heritage studies, museum studies and the digital humanities. The evaluation of our participatory model for community archaeology will draw on and feed into all of these domains, offering a unique chance for inter-disciplinary thinking and dialogue and yielding potentially far-reaching scientific impact. 2. 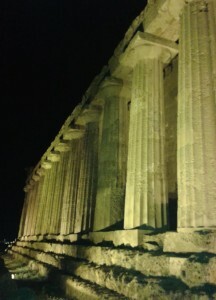 Contributing to a sociological ‘movement’ in Public archaeology. 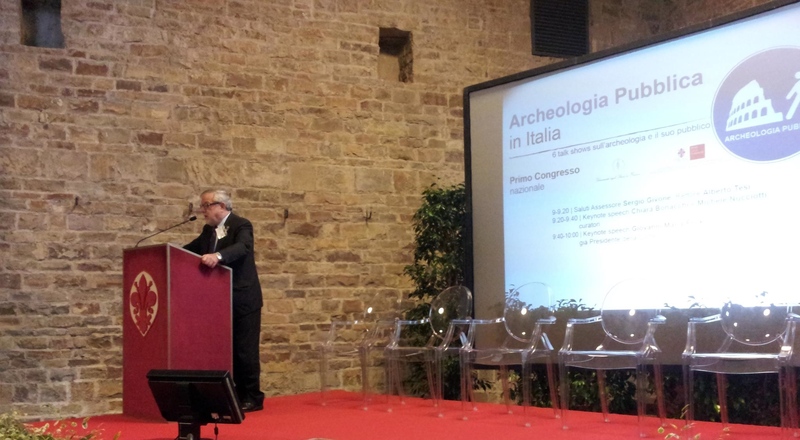 In Europe, Public Archaeology is increasingly understood as the area of research concerned with studying the relationship between ‘archaeology’ and ‘the public’ in order to improve it. Despite this being a widely acknowledged thematic focus, Public Archaeology literature has rarely addressed the topic of the public consumption of archaeological data, materials and knowledge. As a result, very little is known on how people understand archaeology, why and how they engage with it. Through the evaluation of our project, we aim not only to advance current knowledge on archaeological audiences, but also to develop solid methodologies that can be used, in future, by researchers interested in undertaking similar studies. To put it boldly, we wish to contribute to the growth of a sociological ‘movement’ in Public Archaeology, encouraging research that utilises theory and methods from sociology as well as archaeology to shed light on the nature of people’s engagement with archaeological heritage. 3. Helping to understand ‘value’ in digital engagement with cultural heritage. Recently and, possibly, partly as a result of the economic crisis and the higher pressure for justifying public expenditure, greater attention has been devoted to try and define the value of research in the humanities. At the same time, within the cultural heritage sector, increasing efforts have been made to understand how heritage can contribute to positive social change (e.g. to wellbeing, recomposition of conflicts, etc). We would like to take part in this debate, and examine what value there is in joined up research into the human past whereby ‘traditional’ academics and other archaeological enthusiasts collaborate via crowd-sourcing. If you are also researching value within the cultural heritage domain (and beyond), please get in touch! We are very interested in exchanging ideas and open to exploring possible collaborations.